Elsa Casanova (Diane Kruger) is a French war reporter on assignment in Pakistan when Pakistani militants, led by a Western-educated extremist, take her hostage--while trying to rescue a source—along with her Pakistani guide. French Special Forces are sent to Pakistan on a recognizance mission but due to the urgency of the situation, the mission changes status to a rescue operation. The rescue occurs somewhat smoothly, but the team loses their radios and thus the possibility of contacting their rides home. Unfortunately after they miss the encounter with the helos they face a tough choice: make it on foot to the Afghan border, crossing snowy mountain chains, to be found by ally forces on the other side. As anyone can guess, things don’t go as planned because the mountains and the rebels on their tails begin to decimate the group. As you can guess by my rating I loved this movie. I have seen many war movies and I can say that only two have seriously altered my perspective on war and its consequences. The first war movie I saw that I thought was one of the greatest I’ve ever seen was Black Hawk Down; I’ve never seen so much realism in battle scenes as in that movie. 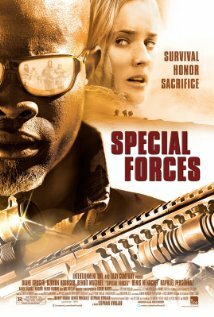 The other movie has been this one, Special Forces. There’s so much realism, raw intensity and valor impregnated in those scenes, even the ones that are merely about survival, that one must think that those men from Special Forces everywhere in the world are nothing short of superhuman. The men in the rescue team in the movie convey that as well as the bond that unites them and makes them one. I’m really impressed with the cast, but two actors in the movie take the cake; one is Diane Kruger as Elsa. Who could guess by watching Diane Kruger in light fare movies such as National Treasure that she was capable of taking in a role such as this and interpreting it successfully? Certainly not I. Diane Kruger has in Special Forces proved she is the type of chameleon that Angelina Jolie is, capable of delivering dramatic lines and thrillers with equal finesse. The other actor who impressed me a great deal was Djimon Hounsou as the leader of the team. In this case there’s no surprise since he has excelled in every role he’s ever undertaken, take Amistad and Blood Diamond as examples and one can surely expect a lot from his appearance in a film.